Actionaz is task automation tool written in C++ / Qt, available for Linux and Windows. Using it, you can run repetitive tasks automatically, all without having to know any programming languages. The tool can emulate mouse clicks or key presses, display message boxes, edit text files, download a file, play a sound, etc. For example, Actionaz can launch an application, perform some repetitive task and then close it, all automatically. Actions supported by Actionaz include: show a message box, move the cursor along a path, emulate mouse clicks or key presses, execute commands or start a process, kill a process, play a sound, open / download URL, show a notification, power options (restart, stop or suspend the system), find an image on the screen, read and write file content and many more. For a complete list of actions supported by Actionaz, see THIS page. 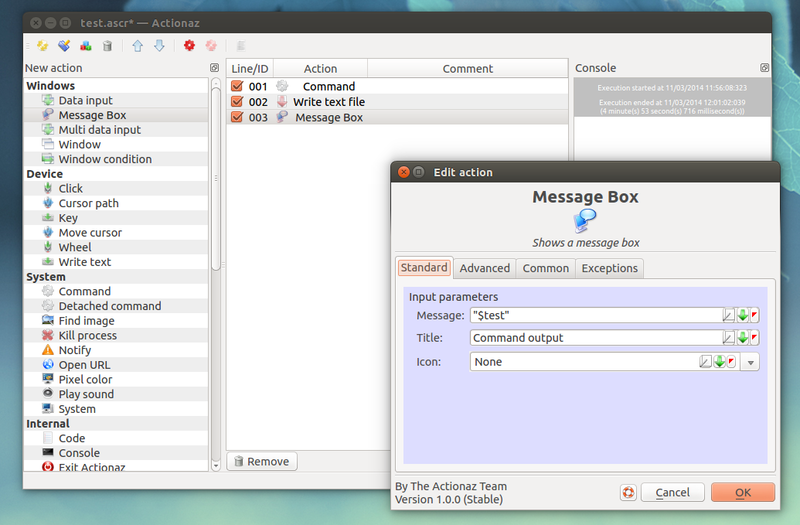 Please note that the latest Actionaz version is not available in the Ubuntu / Debian repositories. Arch Linux users can install the latest Actionaz via AUR.